Through classic recordings of both major and lesser-known pianists, this workshop provides a detailed overview of the evolution of Cuban piano styles and the role of the piano in both dance music and Latin jazz from the 1930s to the present. Open to anyone interested in exploring this rich piano tradition. 2:00 pm – 4:00 pm. Click here for more info or to register. 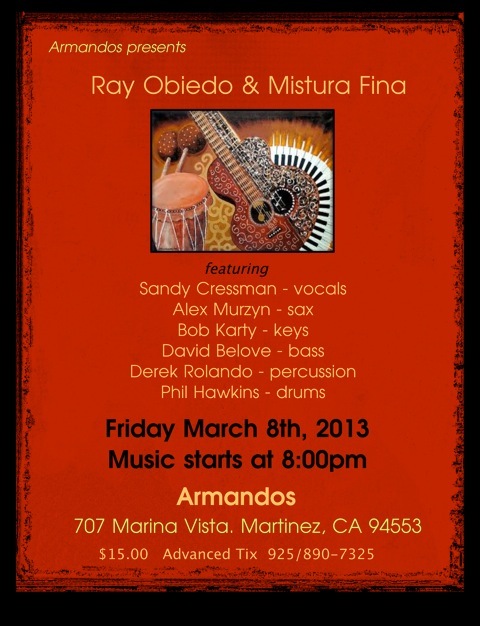 Friday, March 8 – with Ray Obiedo’s Mistura Fina at Armando’s, Martinez, CA. Brazilian and Latin jazz mixed with East Bay funk, featuring singer Sandy Cressman. With Ray Obiedo – guitar, Alex Murzyn – sax & flute, David Belove – bass, Phil Hawkins – drums, and Derek Rolando – percussion. Sunday, April 7 – I’ll present a workshop ‘Music Transcription Techniques’ at The Jazzschool, Berkeley, CA, 2:00 – 4:00 pm. Transcribing music – listening to a recording and writing down what you hear – is an essential skill for every musician. Among its many benefits, transcribing is a powerful ear-training exercise and a useful tool for learning improvisation and arranging. This workshop includes an overview of traditional pencil-and-paper techniques, a demonstration of software tools which aid the process (Sibelius and Transcribe! ), and tips and tricks for developing your transcribing abilities. It’s suitable for both beginning transcribers and those with transcription experience who’d like to add computer tools to their workflow. Saturday, April 27 with Ray Obiedo’s Mistura Fina featuring singer Sandy Cressman at The Sleeping Lady, Fairfax, CA, 9 pm – with David Belove – bass, Phil Hawkins – drums; Derek Rolando – percussion; and Alex Murzyn – saxes & flute. Latin, Caribbean, and Brazilian jazz with a touch of East Bay funk. 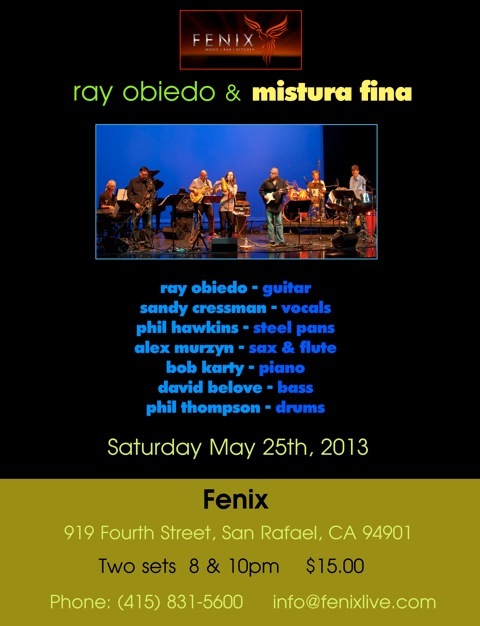 Saturday, May 25 – with Ray Obiedo’s Mistura Fina at Club Fenix, San Rafael, CA. Brazilian and Latin jazz mixed with East Bay funk, featuring singer Sandy Cressman. With Ray Obiedo – guitar, Alex Murzyn – sax & flute, David Belove – bass, Phil Hawkins – steel pans, Phil Thompson – drums, and Derek Rolando – percussion. Sets at 8 and 10 pm. Tuesday, June 4 – with the Roger Glenn Latin Jazz Ensemble at Latin Jazz on the Plaza, part of the Healdsburg Jazz Festival, Healdsburg, CA, 6:00 – 8:00 pm – with Roger Glenn – vibes, flute, sax; Ray Obiedo – guitar; David Belove – bass, Phil Thompson – drums; and Derek Rolando – percussion. A free outdoor concert of Latin jazz at the Healdsburg Plaza Bandstand. Friday, June 14 – with the Roger Glenn Latin Jazz Ensemble at Club Fenix, San Rafael, CA. With Roger Glenn – vibes, flute, sax; Ray Obiedo – guitar; David Belove – bass; Phil Hawkins – drums, and Derek Rolando – percussion. Sets at 8 and 10 pm. Saturday, June 22 – with the Pete Escovedo Latin Jazz Ensemble at Silo’s, Napa, CA. Shows at 7:00 and 9:30 pm. Sunday, July 7 – with Orquesta La Moderna Tradición at The Seahorse, Sausalito, CA. Afro-Cuban charanga – danzón, cha-cha-cha, and timba-infused guaracha. 5:00 to 9:00 pm. 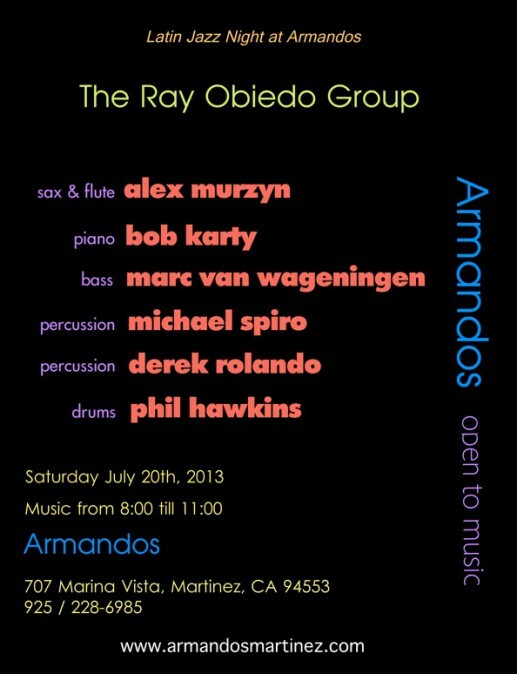 Saturday, July 20 – with the Ray Obiedo Group at Armando’s, Martinez, CA. Brazilian and Latin jazz mixed with East Bay funk, featuring Ray Obiedo – guitar, Alex Murzyn – sax & flute, Marc Van Wageningen – bass, Phil Hawkins – drums, Michael Spiro – percussion, and Derek Rolando – percussion. Sunday, August 11 – with Orquesta La Moderna Tradición at the Napa Town & Country Fair, Napa, CA. Sets at 3:30 and 7:00 pm. Friday, August 16 – with the Pete Escovedo Latin Jazz Ensemble at Angelica’s, Redwood City, CA. With Pete Escovedo – timbales; Derek Rolando – congas; Roger Glenn – flute, sax, vibraphone; Marc Van Wageningen – bass; and Phil Hawkins – drums. Sunday, August 18 with Ray Obiedo & Mistura Fina at Portola Vineyards, Portola Valley, CA – 5:30 – 7:00 p.m. Tickets: $8.00. Saturday, August 31 – with the Roger Glenn Latin Jazz Ensemble at Silo’s, Napa, CA. Music starts at 8:00 pm. Friday, September 6 – with the Roger Glenn Latin Jazz Ensemble at the Firehouse Arts Center, Pleasanton, CA. With Roger Glenn – vibes, flute, sax; Ray Obiedo – guitar; David Belove – bass; Phil Hawkins – drums, and Derek Rolando – percussion. 8 pm. 2nd Annual Rotary Concert Fundraiser with charity drawing to benefit High School Programs. Saturday, September 7 – with Ray Obiedo & Mistura Fina at Club Fenix, San Rafael, CA. Brazilian and Latin jazz mixed with East Bay funk, featuring singer Sandy Cressman. With Ray Obiedo – guitar, Alex Murzyn – sax & flute, David Belove – bass, Phil Hawkins – drums, and Michael Spiro – percussion. Sets at 8 and 10 pm. 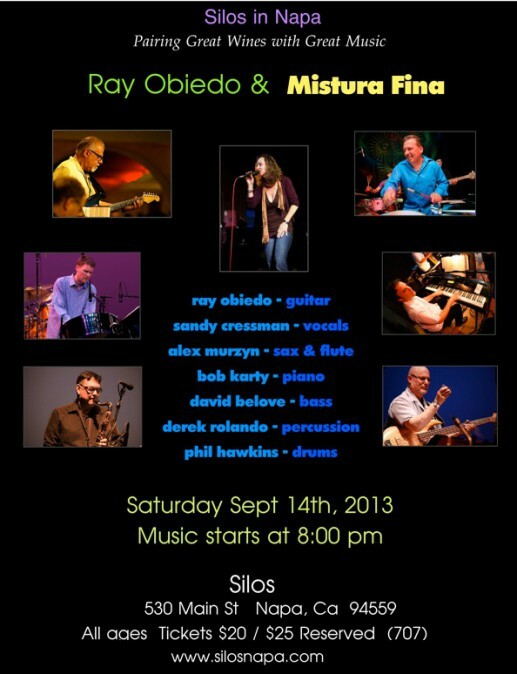 Saturday, September 14 – with Ray Obiedo & Mistura Fina at Silo’s, Napa, CA. Music starts at 8:00 pm. Friday, October 4 – with the Pete Escovedo Latin Jazz Ensemble at Angelica’s Bistro, Redwood City, CA. With Pete Escovedo – timbales; Juan Escovedo – congas; Peter Michael Escovedo – drums; Ray Obiedo – guitar; and David Belove – bass. Saturday, October 19 – with Ray Obiedo’s Mistura Fina at the Empress Theater, Vallejo, CA, 8 pm. Tickets $17 advance, $20 at the door. Brazilian and Latin jazz flavored with East Bay funk, featuring guitarist/composer Ray Obiedo and singer Sandy Cressman. With Alex Murzyn – sax & flute, David Belove – bass, Phil Hawkins – steel pans & drums, and Derek Rolando – percussion. Friday, November 6 – with the Roger Glenn Latin Jazz Ensemble at Angelica’s Bistro, Redwood City, CA.. With Roger Glenn – vibes, flute, sax; Ray Obiedo – guitar; David Belove – bass; Phil Hawkins – drums, and Derek Rolando – percussion. 8 pm. 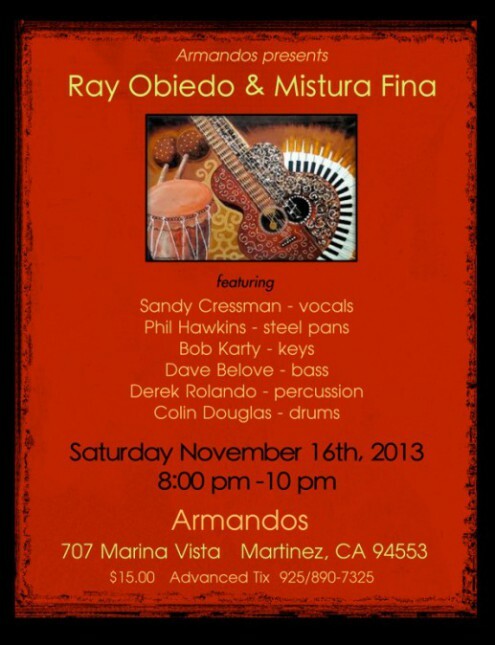 Saturday, November 16 – with Ray Obiedo & Mistura Fina at Armando’s, Martinez, CA. Brazilian and Latin jazz mixed with East Bay funk, featuring Ray Obiedo – guitar, Sandy Cressman – vocals, David Belove – bass, Phil Hawkins – drums & steel pans, Colin Douglas – drums, and Derek Rolando – percussion. 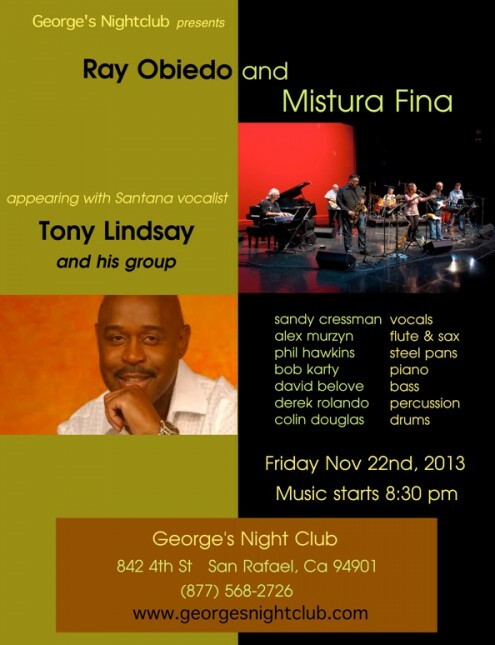 Friday, November 22 – with Ray Obiedo & Mistura Fina at George’s, San Rafael, CA. Brazilian and Latin jazz mixed with East Bay funk, featuring Ray Obiedo – guitar, Sandy Cressman – vocals, Alex Murzyn – sax & flute, David Belove – bass, Phil Hawkins – drums, steel pans, Colin Douglas – drums, and Derek Rolando – percussion. Opening for Santana singer Tony Lindsay and his band. Saturday, December 7 – with the Pete Escovedo Latin Jazz Orchestra at Jazz and Jokers at Niki C’s, Rancho Cordoba (Sacramento), CA. 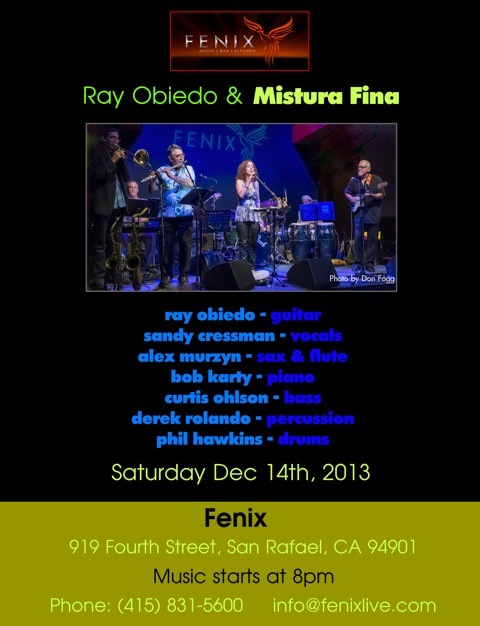 Saturday, December 14 – with Ray Obiedo & Mistura Fina at Club Fenix, San Rafael, CA. Brazilian and Latin jazz mixed with East Bay funk, featuring singer Sandy Cressman. With Ray Obiedo – guitar, Alex Murzyn – sax & flute, Curtis Ohlson – bass, Phil Hawkins – drums, and Derek Rolando – percussion. Sets at 8 and 10 pm. Friday, December 20 – with Juan Escovedo Latin Jazz group featuring Ray Obiedo; details TBA.